My friend Jenny suggested I write a post on this abomination, and it simply too good to pass up running unsolicited commentary on. World, I present to thee: The Puppy Bible. 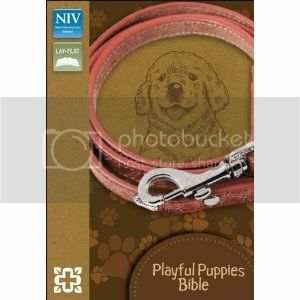 Yes, the Puppy Bible. For all your puppy AND Jesus-loving friends (who just can't bear to separate the two). Like the girl in Free Fallin'. Only with puppies instead of horses. 1. This is the easiest Jesus Juke provocation I could ever imagine. "Oh, the Bible isn't good enough for you on its own? You had to add puppies to it to get you to read it? Shame on you. Shame on you for adding puppies to Jesus. There is a time and a place for puppies, but this is not it. It's like you don't even own an ESV study bible." Once you look at these 12 puppies, isn't that...it? I mean, do you ever look at them again? How long could the excitement possibly last? 72 seconds? Is that really worth the blasphemy? Why not get a puppy-a-day calendar? Or the Internet? Then you get more than 12 puppies to behold, and you don't get struck dead by an angry God. Win/win. 3. Did they decide on 12 puppies because of the 12 disciples? Are said puppies NAMED after the disciples? Are they also DRESSED like disciples? Do the puppies look exasperated from sitting through a three-hour photo shoot dressed like ancient Jews? This is getting more interesting by the second. 4. Guys. Guys. You guys. There is even a RIBBON MARKER. So you can mark your spot (no puppy pun intended). With a ribbon. Is this always still listed as a feature for Bibles? I think it's safe to say by now we assume there is a ribbon marker unless otherwise stated. A feature we would need to be alerted to would be a lack of ribbon marker. "This bible does NOT come with a ribbon marker. We at Zondervan believe it contributes to brain-laziness, so if you're not lazy, buy this Bible. If you are lazy, don't. Whatever. It's up to you. But just so we're clear, you're on your own bookmark-wise." It could happen. 5. There is a sister Bible to this Bible called the Curious Kittens Bible. Which is approximately 400 percent worse, because cats are 400 percent worse than dogs. So if you're going to purchase a Bible with cute animals inside, go big or go home and go puppies all the way. Don't risk your salvation over cats. They're not worth it. They sass. Sure, they're cute for about 2.5 seconds when they're kittens (post-declawing) but then they grow up and want nothing to do with you. I don't reward that kind of behavior. What is the most ridiculous rendition of the Bible and/or Christian marketing tactic you've ever seen? Older PostDo we lose something important by using a Bible app?